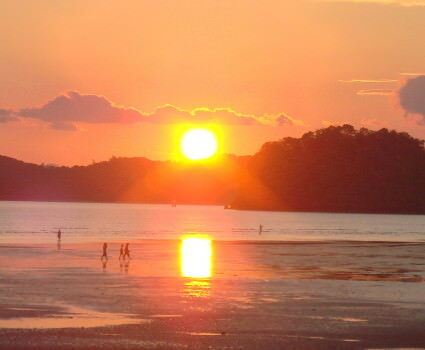 Thailand's Andaman Coast features more variety of environments than most other coastal regions of the world. From dense mangroves forests to the incredibly bizarre karst limestone islands to picturesque beaches. Mix this diverse scenery with the infectious smiles of the Thais, a tasty selection of fresh seafood, relaxing oceanfront inns, spectacular sea kayaking, leisurely bicycling and you end up with a unique, exciting tour - Thailand Land & Sea multi-sport. Our journey through the region begins with a couple of days of leisurely bicycle touring. We will pedal past mangrove swamps and sandy beaches. We enjoy views from atop the hillsides flanking the coast and easy rides along seashore roads. Numerous islands laying close off shore provide untold photo opportunities. Our first leg will winds down with a day of sea kayaking through the picturesque islands and lagoons of Phang Nga Bay. Some of these feature sea caves, which we will paddle into the heart of the island. The towering Karst limestone islands we paddle through, also cover the next leg of our cycling. They are almost to surreal to be real. We will bike through the breathtaking landscapes for a couple of more day, relaxing in delightful lodges tucked under their soaring cliff faces. Our last ride finishes at Krabi's renowned Ao Nang Beach, with its beautiful white sands backed up by more of these towering karst limestone outcroppings. Another day of sea kayaking through Ao Thalane, with its thick mangroves and deep canyons. Join us for a unique multi-sport tour along Thailand's Andaman Coast. 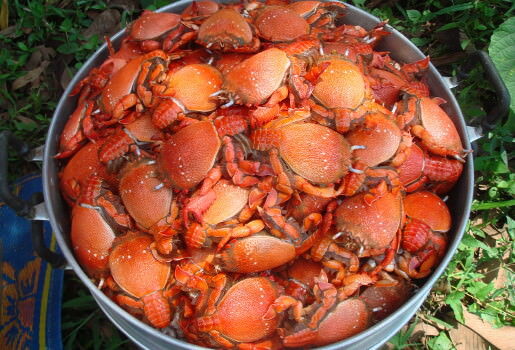 Arrive Surat Thani, free time, enjoy a Thai seafood dinner with fish fresh from the ocean. We will meet you at Surat Thani Airport this afternoon, then transfer to our nearby lodge. After checking into our hotel, we will set up everyone's bike before tour orientation and your first taste of the awesome Thai cuisine prepared in this part of the country. Visit the temple cave of Wat Singh, cycle to Ratchapracha Reservoir, spend two nights in a deluxe floating hotel on the lake. 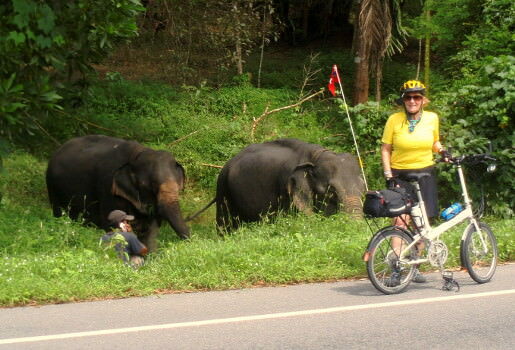 After breakfast, we are off on our bikes, pedaling through the flat coastal agricultural areas surrounding Surat Thani. Off in the distance, you will see the rugged outlines of the Karst mountains slowly growing taller and more distinct as we approach. As we reach this seemingly impenetrable mountain range, you will discover it is actually numerous tall narrow peaks with flat spaces in between allowing easy passage through. Our goal is the Ratchaprapha Reservoir, where we travel by boat to our floating resort. Today we will take a short boat ride to hike to the crystal caves, then in the afternoon take canoes out to explore the shores and towering cliff faces of this area. The colorful cliff faces rising up out of the waters provide awesome photo opportunities and the clear floor of the hotel's lobby opens up an under water world full of fish. 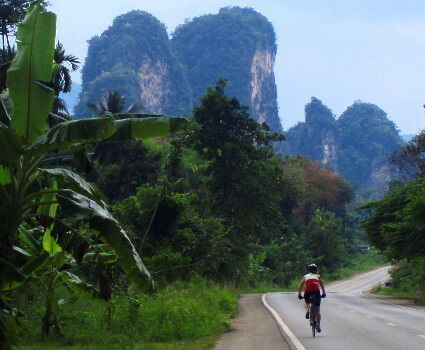 Relish riding through the towering karst cliffs en route to Khao Sok National Park, visit the Fish Temple. We travel by boat back to the dam, then head out on bikes towards the rest of Khao Sok National Park. The landscapes along our ride are magnificent, head turners every last one. We stop by the Fish Cave, to feed its colorful schools of fish, the wind down the day at a beautiful resort sitting under the color karst cliffs. Enjoy some free time at our lodge, before heading out to dinner. Pedal to the coast, explore the historic town of Takua Pa, spend the night overlooking Khao Lak Beach. 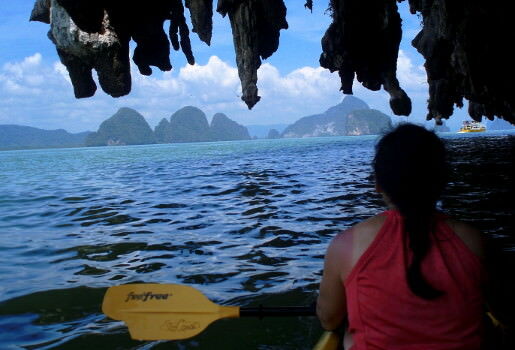 Travel by boat to Phang Nga Bay, use sea kayaks to explore the unique islands and their sea caves. This morning we will leave the bikes behind and enjoy a sea kayaking trip through the breathtaking islands of Phang Nga Bay. Our group will enjoy a self-paddled journey around the island, passing under overhangs with stalactites reaching down towards the sea. We will paddle into the hollow center of the island through sea caves at low tide, perhaps spotting Hornbills and monkeys. And enjoy a delightful fresh cooked Thai lunch on board our support ship. Back on the bikes, through coconut, oil palm and rubber tree plantations, relax at our hotel surrounded by karst cliffs. We will leave the coast behind for most of today's ride as we head inland and wind our ways through the heart of the isthmus. This area is filled with small villages, farms and rubber plantations, where they still harvest the sap and make rubber the traditional way. Our lodging for tonight will be outside Phang Nga town, surrounded by the towering limestone cliffs that proliferate throughout the region. Flat cycling through narrow valleys lined by limestone cliffs of many hues, finish at Ao Nang Beach. Our day of pedaling takes us on a meandering route through the fantastic karst landscapes. Our route is inland and not along the coast today, but the views are awesome and the cycling pretty flat. We will leave the main road before we reach Krabi town itself and head back to the coast, to our lodge at Ao Nang Beach one of the prettiest in the region with towering cliffs dropping straight into deep blue waters. Sea kayaking through Mangrove forests, inhabited by monkeys, celebrate a memorable multisport tour with a delicious seafood dinner. Once again, we take to the ocean, exploring the Ao Thalane region near Krabi by sea kayak. This bay has dramatic canyons and thick mangrove forests that we paddle through, as stark contrast to the open seas and scattered islands of Phang Nga Bay. Perhaps we will spot monkeys or Monitor Lizards lounging in the forests. You have the afternoon free to relax before enjoying an awesome dinner of fresh seafood. After breakfast we will be shuttling folks to Krabi Airport for your flights home on onward to more adventures. Everything about the trip organization speaks to the practice and experience of the guides, both American (Tom) and Thai (Noom). All our hotels were basically great, and we stayed in some beautiful national park resorts, and for every issue or difficulty presented by our fellow riders, Tom and Noom has a smile and a solution. They can soothe picky eaters while managing not to bore adventurous ones. They have turn-by-turn route maps printed out so intense cyclists can push ahead with confidence while more casual sightseers can tootle behind and take pictures of temples and cows. They know secret detours where you can feed monkeys, and they have been coming on some of the island tours on kayaks through caves and mangrove swamps for long enough that they can also give advice about not cutting yourself on oyster shells. A quiet garden oasis located in the heart of Surat Thani. Boutique resort located under karst cliffs, enveloped by nature and quiet. Delightful, intimate resort with rooms set on the cliffs overlooking Khao Lak Beach and town, just minutes away by foot. Phang Nga city's first hotel lovingly restored by a local family, simple and friendly. Beautiful boutique resort in the heart of town, but feeling like you are miles away in the jungle. Fill in the blanks and the tour details for Bike Across Southern Thailand will be on their way.